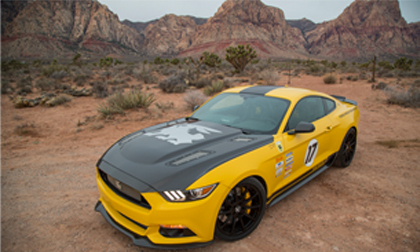 LAS VEGAS – Jan. 25, 2016 –Shelby American, Inc., a wholly owned subsidiary of Carroll Shelby International Inc. (CSBI:PK), will introduce the 750+ supercharged V8 Terlingua Racing Team® Shelby at Barrett-Jackson’s Scottsdale Auction on Jan. 26, 2016. A limited number of the amazing new Shelby performance cars will be built based on the 2015-16 Ford Mustang GT, America’s best-selling sports car. Ever since Shelby American introduced the highly sought after, limited edition V6 Terlingua Mustang in 2006, fans of the Terlingua Racing Team brand and eponymous jackrabbit logo have wondered when a V8 version would be available. In cooperation with Bill Neale, one of the Terlingua founders and Terlingua Racing Team crest designer, that wait is over. Shelby American will build a total 75 (50 for the USA and 25 international) of 750+ horsepower Shelby Terlingua Racing Team Mustangs. Last year, Ford introduced an entirely new Mustang that captured the attention of enthusiasts worldwide. The sleek car has a powerful V8 engine, slick shifting 6 speed transmission, sophisticated independent rear suspension and stylish interior. It was also designed for international markets, giving more people the chance to enjoy genuine American performance. Shelby customers can choose to build their Terlingua on either the manual or automatic transmission 2015-16 model year 5.0L V8 Mustang GT. Specifications for the Shelby Terlingua build upon the exciting new Shelby Super Snake. On top of the 750+horsepower supercharged engine, the Terlingua Shelbys will be built with racetrack-proven Ford Performance half-shafts, short-throw shifters and Borla exhausts, as well as exclusive Shelby by Eibach adjustable coil overs and sway bar, Brembo brakes and updated, more aggressive carbon fiber exterior parts. In honor of the Terlingua Racing Team legacy, all cars will carry an autograph plaque of Bill Neale, Carroll Shelby and Jerry Titus, the 1967 Trans Am Champion winning driver. One of the key aspects of the new Terlingua Shelby is its flexibility. Those who want to make it a track day racecar can add a host of upgrades including a Barton short-throw shifter, Sparco race seats, 4-point harness and a roll cage. It’s the perfect car to drive to the track in style, lay down some fast laps and then drive home again. The Shelby Terlingua Racing Team Mustang starts at $65,999, not including the base Ford Mustang GT. More information is available at www.Shelby.com, emailing Sales@Shelby.com or by calling (702) 942-7325.